Professor Armand Leroi visits the Greek island of Lesvos to discover the creatures, places and ideas that inspired Aristotle during his pioneering work in the science of biology. Browse content similar to Aristotle's Lagoon. Check below for episodes and series from the same categories and more! There is, in old Athens, a bookshop. and within it I found something wonderful. the collected, translated, works of Aristotle. But I wasn't much interested. at the shrine of Aristotle, but not scientists. And then I opened one. The Natural History of Animals. where they live and what they do there. Assertion followed assertion, fact followed fact, like hammer blows. It was long, it was dense, it was impenetrable. And yet, it was magnificent. had also known, loved and sought to understand the natural world. analysed and documented the world of animals and plants. And did so in a wholly new way. and there he invented a science. And though it was my science, biology, I did not know it. But then, hardly anyone does. trying to understand the workings of his astonishing mind. Why did he do it? And how? the first, and perhaps the greatest, biologist ever? the lagoon where Aristotle worked was on the Aegean island of Lesvos. That same day, I boarded the evening ferry from Piraeus. It's 347 BC and Aristotle is fed up. first as a student, then as teacher. But now Plato is dead and there's vacancy at the top. Who should be the new head of the Academy? "Well", thinks Aristotle, "obviously it should be me." in the philosophical hothouse, he's the best. Plato calls him The Reader. And he's original. Perhaps excessively so. In the event, the job goes to Plato's nephew. "I'll pack my bags and go where I'm appreciated." I have come to know and love this island. an ecologist at the University of the Aegean, Mytilini. It was he who first took me to the lagoon. And it is he who takes me there now. Aristotle did so much of his ground-breaking biology. He knew it as Pyrrha. Today they call it Kalloni. But, for me, it is "Aristotle's Lagoon". Lesvos is the perfect place for a naturalist. is the natural world so endlessly present and richly seductive. Lesvos draws its creatures from both. migrating between Africa and the north. What do we see over there? Filios Akriotis, Greece's leading ornithologist, lives on the island. in the marshes and woods that flank the lagoon. For me, science is an endless conversation about the world. Was it so for Aristotle? at the invitation of a friend, Theophrastus. -At least, that's what many scholars believe. But who exactly was Theophrastus and what did he do? He was a botanist, I gather. of a very big variety of plants. have their scientific names based on his name. One imagines the two men, friends, dividing up the natural world. "I'll do the animals", says Aristotle. "You, Theophrastus, do the plants". And so zoology and botany were born. He says that tortoises have shells, hiss, lay eggs and hibernate. That snakes copulate by entwining themselves. He describes the life cycle of the cicada. short legs that lives on rocks, obviously a rock nuthatch. He turns his attention to the water's edge. "the vegetation is more delicate and lush than any garden. use their beaks as fishing spears. And that stilts are very quarrelsome and do not have a hind toe. in holes that they dig in riverbanks and how they breed. This is the philosopher discovering nature. He was not prejudiced by anything. some time ago and had read about it when he was young. Yes, a freshness. That's what I admire in his writing. Everything he writes seems to be his own observations. "no matter how perfect and divine they may be. "even if they seem repugnant to us. "something of the divine, something of the beautiful". Aristotle is no mere naturalist. He collects facts, lots of facts, and arranges them. he names and distinguishes 110 kinds of animals. And he's especially good on fish. What is this beautiful thing? and they're all the fish that Aristotle describes. And he does so in wonderful detail. in and out every year. But Aristotle also notices that some species resemble each other. into larger groups and you can see them here. Such as these things which I am trying to get. because they all have rather hard exteriors. into a different group because they have legs. It's the beginning of the great classifications that we know today. Not all of his classifications have stood the test of time. quite unrelated to each other. But the 19th Century discovered that. And he's superb on dolphins. just as many land quadrupeds do. in a group of their own. His successors ignored him and just called them fish. What makes a scientist turn to the study of the natural world? So often, it is a place. confusion and it is where he first begins to wonder why. And that is Aristotle's question. For he's in search of the deepest causes of things. pressing wild flowers and check listing birds. He has to get into the guts of things. But to do that, Aristotle first had to find a friendly fisherman. So what do you say? Let's do some fishing. in and around the lagoon that they cannot all be Aristotle's own. He must have interrogated people who knew about animals. As Darwin wrote to pigeon fanciers, so Aristotle spoke to fishermen. So roughly where are we going? Are we going over there to the right? That direction. About in the middle. About in the middle. About half way down the lagoon. -The lagoon cuts the island of Lesvos nearly in two. The first few traps are empty. But there are cuttlefish down there. The net's just covered in them. God, there must be thousands and thousands of cuttlefish down there. You can see the embryo. Look. -You can see the embryo! I thought they stayed black all along, throughout their development. No, some of them, they haven't been sprayed. -Not all of them. Very few. -You mean they haven't been fertilised? -they spray with the ink to protect. -Oh, I see. I see. The ink is the last thing they do. But, the pale ones, you can see right inside them. And you can see the little baby cuttlefish. -And they're moving, you're absolutely right. You can see its eyes. You can see exactly as Aristotle describes it. My god, they're gorgeous. They're amazing. In a week or two, they all will be gone. and Aristotle has a lot to say about them. and how they eject ink when they're afraid. How they breed. How they hunt with these amazing long tentacles. And the fact that they only live for about a year. One of Aristotle's masterpieces is the dissection of the cuttlefish. Aristotle describes the anatomy of a cuttlefish in detail. he describes its reproductive organs. This is a female. These are the glands with which it produces the shell. the guts are bent around such that, in effect, it defecates on its head. are at the opposite ends of their bodies from their mouths. is a big orange thing, which he calls the mytis. And it's right in the middle of the body. or at least the equivalent of a cuttlefish heart. argues that they are the same thing. everything else he does is just incredibly impressive. on the cuttlefish and lizards and so on and so forth. But it isn't. In fact, it's ordered by system. There are sections on digestion and reproduction and life cycles. Really, it's ordered like any modern invertebrate zoology textbook. isn't simply accumulating natural history knowledge. He's doing something much more systematic. And therein lies a paradox. for us to understand just how original he was. he was the very first person to have ever done so. having arranged his facts, he begins to explain. He pits theory against observation. He invents a new way of understanding the world. ..how life originates in the egg and in the womb. He wants to know how, the words are his, living things "come to be". you have to do what Aristotle did. and get yourself some fertilised chicken eggs. what you are actually going to see until you open the egg. you see exactly what Aristotle saw. Aristotle would have looked inside the egg with the naked eye. ..you can see what I'm seeing. the vitelline arteries and veins ramifying into its surroundings. You can see its head. You can see its eye. And above all, you can see its little heart, just beating there. have to give him credit for this. He's the first person to open an egg and describe the embryo of a chick. He's the first person to describe the origin of a living thing. into a living, breathing, copulating creature. he would be worthy of our admiration. But I think he did much more. penetrating to the very deepest secrets of life. Why do chicks hatch from chicken eggs? Why not tortoises, fish or snakes? It sounds like a trivial question, but it isn't. It's a question about why progeny look like their parents. It's a question about inheritance. blocks of the world, cannot explain how an embryo constructs itself. Something that it gets from its parents, something that shapes it. And he called that thing eidos. Well, this is where Aristotle gets hard. This is where he we hit his metaphysics. We need a classical philosopher. Richard King and I have been talking Aristotle for years. "well, that's the form and the form is different in each case. "So the form is different from the material constituents". it's made that matters, it's the way in which that stuff is ordered. just as the order of the letters makes the two different syllables. So what eidos really is is something like information? That's right. Information or a kind of activity. that we use when we speak about the genetic code, about DNA. the molecules, the nucleotides, that's the information. was simplicity itself. He cut them open while still alive. it lives for a surprisingly long time. Well, lots of modern biologists vivisect insects. "the chameleon continues to breathe for a considerable time." "even after their hearts have been removed." I don't know how long a tortoise would survive without its heart. And I am not, I think, inclined to find out. to one of the deepest parts of his research programme. The ancient Greeks allegorised the soul as butterfly. They used the same name for both, psyche. It's easy to see why. yet lives on in Hades. It's the soul as spirit. Aristotle's view of the soul is very different. He thinks that all living creatures, not just humans, have one. He thinks that mussels and clams and lobsters and crabs all have souls. Or at least they did when they were alive. For, Aristotle thinks, when a living thing dies, its soul dies with it. This is the soul as biology. Yet when you read Aristotle on the soul, it seems rather mysterious. It's not material, yet it controls matter. It's not an organ that you can dissect out and hold in your hand. It's something much more abstract. The soul is the network of command and control that makes a creature. it's the senses with which it perceives the world. And in the case of a man, it's the thoughts he thinks. It is what 21st century biologists simply call The System. and the circuitry of genes and proteins that control it. collapsing into heaps of inert matter. What Aristotle calls the soul, we call the system. What he calls eidos, we call genes. The language is very different but the concepts are much alike. generation upon generation, shapes living matter. Why, then, are there so many species? a religious one, God made them, and a scientific one, they evolved. but he lived 23 centuries before Darwin. So is he a creationist? His teacher Plato certainly was. and it's a frank Creationist myth with a moralising twist. the low-minded became lizards, snakes and things that crawl. Only the sober-minded remained human. Aristotle thinks all of this is nonsense. He has no time for creation myths, all that talk of the ancient Gods. "I love Plato", he said, "but I love truth even more". So is he an evolutionist? the environments in which they live. He describes how the beaks of birds are suited to their food. "Creatures are", he says, "designed to survive and reproduce". there isn't a celestial designer. Nature designs living things and does so beautifully. He thinks that some animals are more advanced than others. There is a scale of complexity. between quadrupeds and humans, which is certainly true. It all sounds terribly Darwinian. For Aristotle isn't an evolutionist. that we see before us has simply always been there, unchanging. He is, in other words, an eternalist. It's a difficult idea to understand. between Creation and Evolution and Eternity simply isn't an option. but the same place forever and forever and forever. the fact that he doesn't say anything about fossils. It's hard to see how Aristotle missed this. of a vast forest, but the trees are now stone. It is one of the world's great petrified forests. Some people say that theory blinkers scientists. I don't think that's true, at least not in any strong sense. for a field of stones. An ancient volcano covered them in ash. you can still see their leaves, bark and tissues. the founder of botany, lived just a few kilometres away in Erissos. the Director of the Lesvos Petrified Forest, about it. and I am sure that once he visited this site. that he would have seen these silicified trees. or like Theophrastus, have not seen this. Perhaps he just missed the entire forest. Perhaps it was covered up. but because he didn't believe in them. why then are there so many of them? are connected to each other in very complex ways. the Greek is oikos, from which we get our "ecology". And in the household of the world, every species has its own role. Aristotle knows that households are not always harmonious. He understands, as Darwin would, that there is a war of nature. go extinct, in Aristotelian wars the combatants simply fight forever. Aristotle's household, the sun, the planets and the stars are as well. His ecology embraces the cosmos. And regulating it all is God, a God who simply thinks. he is also the reason for life on earth. It's a beautiful, if slightly mystical, doctrine. dissected and classified is, in fact, sacred. he would surely be Aristotle's. Aristotle's world is very different from ours. one that can be seen in this very lagoon. he wouldn't have been by the water's edge. have been shifting the islands beneath the Aegean. And for millions of years the shoreline has been rising. The ecology of the lagoon has changed, too. The most enchanting creatures that live here are surely the flamingos. For all their flamboyance, Aristotle does not mention them at all. They are newcomers and only arrived here a few decades ago. Other changes to the lagoon's ecology are more disturbing. and over fishing are taking their toll on its creatures. I asked him about the lagoon's future. in the entire Aegean. And actually, in the entire world, I would say. Biodiversity is threatened, fish catches have lowered. there is nothing else to fish down there. of that larger picture of ecological devastation. makes the destruction of this lagoon a thing of unutterable sadness. in the fact that history has now caught up with it. Aristotle continued the work that he began on Lesvos. physiology and development of animals. another on ageing, another on movement. There is a book on the soul. Muslim physicians and Medieval scribes. it was being taught throughout the universities of Europe. depicting the creatures that Aristotle had seen. not unlike this one in a small village near the lagoon. that modern biology was founded on Aristotle. why have we forgotten him? One reason is that some of his biology was, very simply, wrong. He was very wrong about eels. Whoa! It's a big one. Which kind is it? Is it leptocephalous? at the bottom of the rivers. -Why would he say that? in the mud, just go... Go directly inside and disappear inside. See, all this time, we never saw an eel with eggs. So what do you think that tells us? I don't know. This is a mystery. This is a eel mystery. Nobody knows. Well, marine biologists do know, but Aristotle certainly didn't. I think we've got enough, don't you? Aristotle noticed that eels are very unusual creatures. that you would find in any fish. the gonads, the sperm and the eggs. how, if an eel doesn't have eggs or sperm, does it reproduce? to its spawning grounds in the Sargasso Sea. He seems to think that some kinds of creatures don't reproduce. They just appear from nowhere. -They "spontaneously generate", to use his term. don't come about from animals of the same kind. in the sea above all, but also with almost all insects. Quite why he does that is a very peculiar question. that they didn't actually ever reproduce. It had immense influence on biology. One of Aristotle's less happy theories. One of his catastrophic mistakes, I would say. often seems to breed other creatures. found dead at the side of a road. I'm cutting it up in order to see what's inside. The lizard has become rather mummified in the intense heat. that it's crawling with maggots. that flies are, in his words, "spontaneously generated"
-You find these just here in Kalloni? The fish from Kalloni, are they nice? -They are the very best. -The best. And I'll take one of these guys. the real reason he became discredited. Rather, it was the failings in his method that this belief exposed. of a brilliant, albeit eccentric, colleague. the same invidious references to predecessors. cover one with gauze and leave the other exposed. A week later, I look at the results. and exposed to the elements. Such as this one here. but there aren't any maggots. you first have to get flies that lay eggs in them. was the experiment that Francesco Redi did in 1668. It demolished Aristotle's theory of spontaneous generation. And his reputation never recovered. At the heart of this story lies a tragic paradox. they first asked, "What did Aristotle think?" that invariably he had an answer. Aristotle, or rather his epigones, became an impediment to progress. "Study nature, not books" and by that, they meant Aristotle's books. and reach the green fields of scientific truths that lay beyond. Aristotle stayed in Lesvos for just two years. whom history would call the Great. where he founded his own philosophical school. 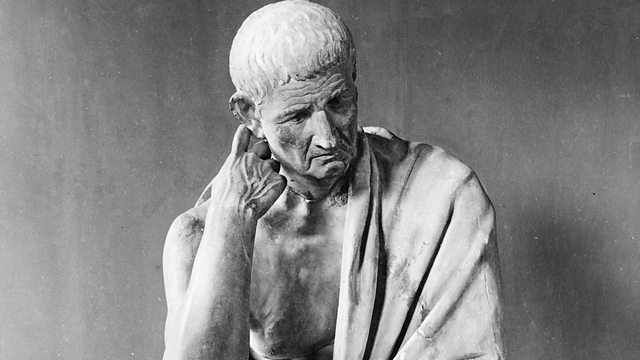 He thought, wrote and, in 322 BC, died. What, then, are we to make of Aristotle? or condemn him for his errors? are exquisitely fitted to their environments. That they are adapted and that adaptation requires an explanation. but rather that they need something else. we also have to put them back together again. For only when we do so will we really understand how they work. And it is this that, I think, makes Aristotle speak to us today. putting them back together again is the task of the 21st. even when we do not know it ourselves. with ideas that are apparently new but are, in fact, very old. Is this view of Aristotle anachronistic? He is so vast, so protean, that each generation must read him anew. they always find things in him that their predecessors have missed. the first in his Metaphysics, defines him. "All men", he says, "desire to know. "the pure and disinterested search for the causes of things". "Searching for them is the best way to spend a life". It's a claim for the beauty and worth of science. In the 4th century BC the Greek philosopher Aristotle travelled to Lesvos, an island in the Aegean teeming, then as now, with wildlife. His fascination with what he found there, and his painstaking study of it, led to the birth of a new science - biology. Professor Armand Leroi follows in Aristotle's footsteps to discover the creatures, places and ideas that inspired the philosopher in his pioneering work.